Loloi Collaborates With Rifle Paper Co.
A collection of rugs and pillows will debut at October's High Point Market. Loloi has announced a new collaboration with international stationery and lifestyle brand Rifle Paper Co. This first-ever collection of rugs and pillows for Rifle will debut at the fall High Point Market in Loloi’s showroom, IHFC D320, and will be available to consumers immediately following on riflepaperco.com as well as in select retail locations nationwide. The illustrations of Rifle Paper Co. co-founder and Chief Creative Officer Anna Bond will be brought to life in a series of original designs inspired by the aesthetics of antique Persian carpets, lush gardens and vintage patterns. 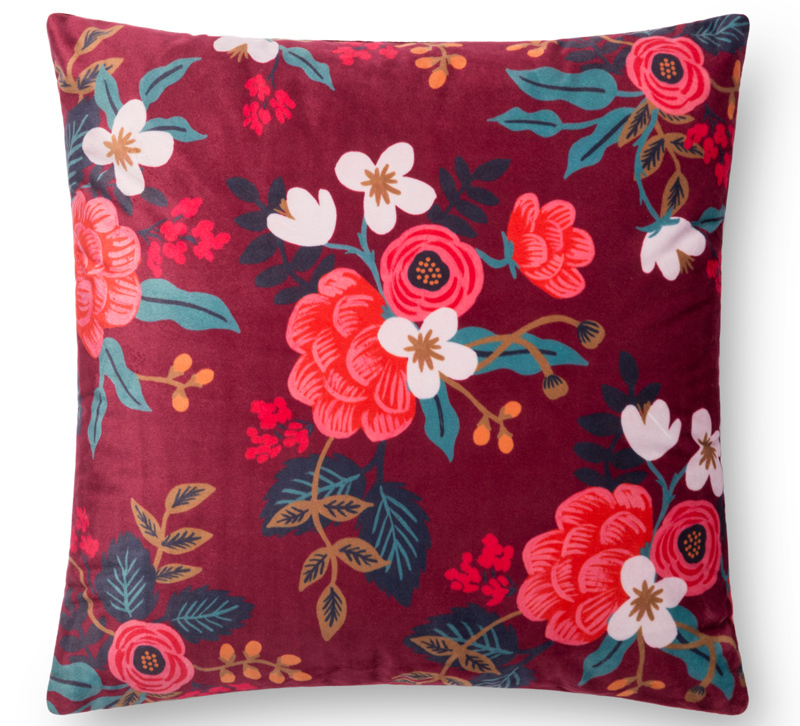 Her iconic floral patterns like Juliet Rose and Wildwood are also present in the collection, while her treasured travel art prints will come alive in new throw pillow designs. Featuring designs reminiscent of the iconic Rifle Paper Co. aesthetic, the Les Fleurs Collection is a soft, 100 percent wool collection carefully crafted by artisans in India. A fresh take on florals, the bold and over-scaled motifs are accentuated by hours of hand-carving, creating depth and dimension. Vintage meets modern in the highly durable and well-designed Nairi Collection for Rifle Paper Co. x Loloi. Power-loomed in Turkey of polypropylene and polyester, this collection features a soft pile that doesn’t shed, and is stain-resistant, fade-resistant and colorfast. And with a broad range of sizes including runners, there’s a piece for any and every room. Bold and bright, the Palais Collection for Rifle Paper Co. × Loloi grounds any space with whimsical motifs and playful colors inspired by Anna Bond’s illustrative artwork. Each piece is printed on a soft polyester base, ensuring comfort underfoot, colorfastness and stain-resistance. “When thinking about rugs and pillows, my goal was to create designs that brighten up the home by bringing in unique colors and patterns,” explained Anna Bond.